Delicately spiced fried vegetable fritters. Two crispy pastries filled with potatoes and peas. Chopped cucumber, onion, tomato and green peppers. A mild flavored lentil soup with chicken and rice. Chicken breast dipped in special batter & deep fried. Squid battered and quickly deep fried. 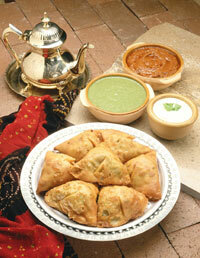 Vegetable samosa, chicken pakora and vegetable pakora. Multi-layered flaky bread with butter. A white leavened bread with garlic and basil. A white leavened bread stuffed with spinach and paneer. A must for every meal: white leavened bread. A white leavened bread with onion and cilantro. A white leavened bread stuffed with spicy potato. Tandoori cuisine is an ancient Indian method of cooking. All Tandoori dishes are served with Basmati rice. Half chicken marinated with authentic Indian spices and grilled in the tandoor. Boneless chicken breast marinated in cashew nut, cream and grilled in the tandoor. A fish marinated in fresh garlic, ginger, spices and grilled in the tandoor. A rack of lamb marinated in garlic, ginger, mustard oil, lemon juice and grilled in the tandoor. Boneless chicken breast marinated with our special ingredients and grilled in the tandoor. Tender pieces of lamb marinated in ginger, garlic, Indian spices and grilled in the tandoor. Prawns marinated in Indian spice and grilled in the tandoor. All curry dishes are served with Basmati rice. A creamy tomato sauce cooked with selection of your choice. Dry Fenu-Greek leaves cooked with garlic in special curry. A unique combination of cilantro and coconut curry cooked with item of your choice. Zesty curry cooked in tangy sauce with vinegar and potatoes. Stir fried green and red peppers, onions and tomatoes in special sauce with an item of your choice. A traditional dish cooked with Indian spices in cashew nut cream sauce with an item of your choice. Onion, tomato, fresh ginger and spices cooked in Kadhai (Indian Wok) with an item of your choice. Cream of spinach cooked with garlic, ginger and Indian spices with an item of your choice. Fresh cauliflower and potatoes cooked with fresh ginger, tomato and Indian spices. Garbanzo beans and potatoes cooked delicately with fresh onion, ginger, garlic and spices. Minced paneer and vegetable balls cooked in a creamy sauce. Whole eggplants roasted on open flame, peeled, then cooked with onion, tomatoes, garlic and ginger. Creamed lentils cooked with Indian spices. Fresh mushroom cooked with onion and Indian spices. Homemade paneer cooked with peas. Peas cooked with potatoes and onion sauce. Basmati rice cooked in onions and their own aromatic flavor. Basmati rice cooked with prawn and Indian spices. Basmati rice cooked with vegetable and Indian spices. Deep fried balls of light cheese in sugar syrup and rose water.